…works to advance a more efficient and responsive philanthropic marketplace by evaluating the financial health of over 5,400 of America’s largest charities. Think You’re a Film Buff? Name That Movie puts up six iconic drawings, by Paul Rogers, from classic films. Figuring out which film each set references is harder than you would think. 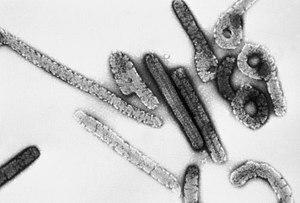 “The Marburg virus had never before reached North America, as far as experts know. It is a close relative of Ebola, and the diseases these viruses cause are among the world’s most dreaded, because they can have horrific symptoms and high death rates and are easily transmitted by bodily fluids. There is no vaccine, cure or even specific treatment. Infectious disease experts had warned for years that someday an infected person might board a plane and carry one of these deadly viruses halfway around the world, potentially exposing countless others along the way. Now it had happened.